Under the Bed Slot by BetSoft - This Colourful 3D Slot Includes Monsters and Things that Go Bump in the Night! There are two ways that you can look at what the original idea behind this 3d BetSoft slot was. First, the developers designed a slot based around the irrational fear a child has that a monster lurks under the bed. Second, the developers might just have watched the film Monsters Inc. and designed a slot with many similarities to the film (a little green monster with one eye – wherever did they get that idea from??!) Whichever it was, this slot by BetSoft works – it looks good and is certainly addictive. I start the review by looking at how the game actually works with the options available to the players and a look at the pay table. 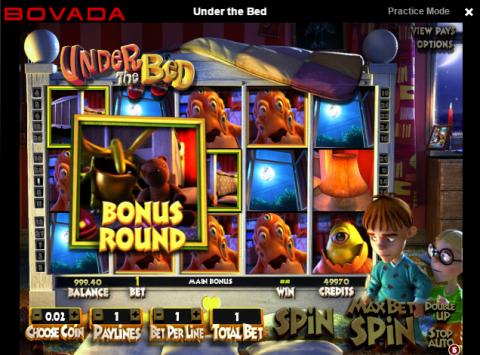 I move on to look at the features in the game, including the free spins and the under the bed bonus round. I finish with an overall summary of the game before recommending a particular casino where you’ll enjoy this slot. The Under the Bed slot is a 5 reel slot that has 30 win lines. You have a choice of playing anywhere between 1 and 30 lines, as well as choosing the total bet size and the coin size. A combination of all three will dictate the cost of each spin. You’ll win at this slot by landing consecutive symbols from left to right, every symbol paying for landing at least three in a row – although obviously the bigger prizes are reserved for when landing 5 in a row. There are nine standard paying symbols in the game. The best of these is the girl character which pays out 500 coins when landing 5, closely followed by the boy (400). Other characters are the mum, four different monsters, a bedside lamp and an open window. The first bonus feature involves the four monster symbols. These will randomly have a rim around the edge of the symbols and should you receive a win that includes one of these rimmed symbols the feature is activated. Here the rimmed symbol will turn over to reveal a number and this symbol will now become a wild one for that amount of spins. The second bonus feature is a gamble one. You’ll be able to gamble after any win by clicking the ‘double up’ option. Here you’ll be taken to a screen featuring a monster playing with dice (nothing unusual there!). He’ll roll three dice and you’ll gamble on whether the total of the dice is either odd or even – get it right and you’ve doubled your money, get it wrong and you’ll be wondering why you bothered gambling! The third feature is the mysterious door one. This is activated if landing this symbol on the centre of the middle reel. This will earn you 12 free spins at the slot and hopefully a nice winning amount. The final feature is the best one – the under the bed feature. Here you’ll be taken to a screen where the two children are huddled on the bed. At the bottom of the screen are five face down playing cards and you’ll pick one a time. Reveal a monster and you’ll win a prize. Keep revealing monsters and you’ll keep winning, but the moment you reveal the mum, the round is over. This round is a good test of your humanity – do you want the children to be comforted, or do you want to keep revealing monsters and win more money? Personally, I’d take the money! This slot is an enjoyable one. Firstly, it looks good – the cartoon animation in the game really brings it to life, and this is most evident during the feature rounds. Secondly, the game has a lot of variety, the range of features meaning you’ll have a hard time becoming bored. Overall this is a game that I will definitely be returning to – this is more fun than the majority of slots out there. This slot can be played at the excellent Bovada casino. This casino has a wide range of casino games, including many more impressive slots and roulette, blackjack and Video poker variations. At Bovada you can also enjoy an industry leading sportsbook and an excellent poker site. When joining the site you’ll be able to take advantage of a bonus scheme that could earn you as much as $3,000 – what’s not to like? Check out www.bovada.lv for yourself now!